“Provide and Pray” is a prevalent worst-practice in corporate attempts to tap into the collective genius of the organization. GARTNER research shows that over 90% of these efforts fail. 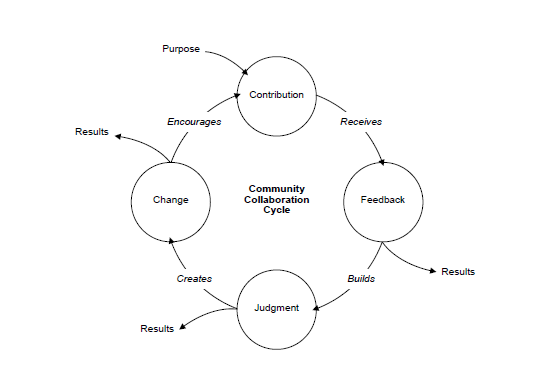 They talk of a fundamental cycle of collaboration at work. A compelling purpose attracts enough people to the community that contributions appear. Contributions are transparent. They are visible to the whole community. The social platform provides some mechanism for feedback on contributions. With enough feedback, judgement appears. Meaningful contributions attract “likes” and come to the top. Content that the community does not find useful or aligned with its purpose sinks to the bottom and out of sight. The community thus polices itself. This cycle produces change in behavior and enables development of mastery. Can you pick this pattern apart to find the drivers of motivation at play?